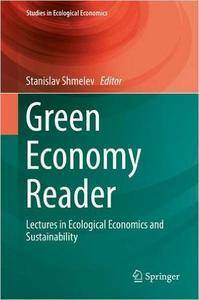 Stanislav Shmelev, "Green Economy Reader: Lectures in Ecological Economics and Sustainability"
State of the art in sustainability thinking, inspired by interdisciplinary ideas of ecological economics. 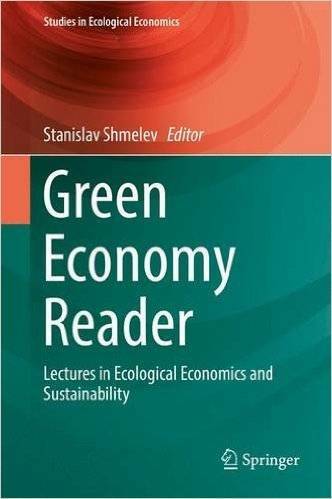 This book is focusing on sustainability pathways, new economic theory, democracy and institutions, multidimensional assessment of sustainability, macroeconomic modelling and policies, climate change and renewable energy, resource flows and circular economy, regenerative cities, environmental conflicts and values. It will be helpful for MSc and PhD students in Economics, Management, Environmental Change, Ecological Economics, Development Economics, Sustainability and practitioners in business, international and nongovernmental organizations. Rich, diverse and thought provoking collection of top level contributions, it will help to facilitate the transition towards sustainability and educational reform. The book goes well beyond the Green Economy, offering arguments and blueprints for a complete makeover of the current economic system. With multi- and interdisciplinary contributions ranging from moderately to fundamentally critical of current economics, it raises fundamental questions of value and power, draws on a wide range of theories, opens the eyes for the historical processes that brought about the current crises and demonstrates the value of ecological, but also classical economic thinking to their solution. If better politics require better theories, this is a must read for academics and decision makers in the time of climate crisis. Joachim Spangenberg, Sustainable Europe Research Institute, SERI Germany e.V.